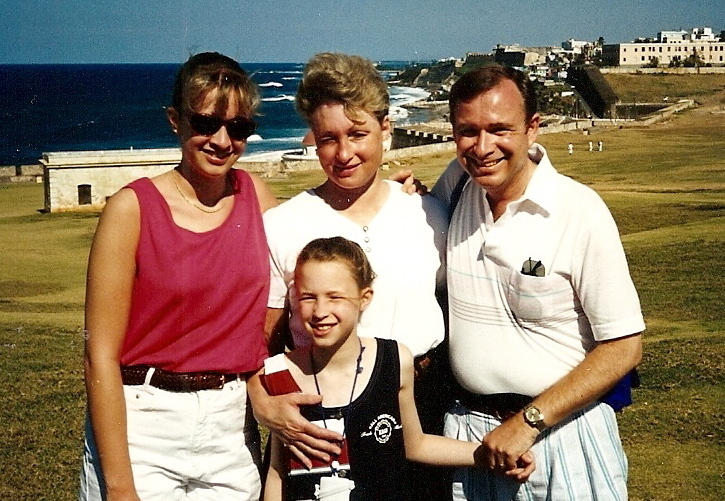 My mom, dad, sister & I in Puerto Rico back in the day.. This is going to be a quick post! It has been a pretty long & busy day for all of us. We just got back from the movie “Morning Glory”. It was excellent! I loved looking over & seeing my mom with a huge smile on her face & seeing her laugh. Makes everything about my life worth it :). Jenna & dad were able to come along with us as well. I love some good family time. My brother Nathan is never able to come along with us because he works such odd hours. He does exist though! I promise! I had a nice long chat with him on the phone last night & all seems to be going well in his life. If he is getting overtime at work…he is one happy man! We also got a surprise visit from Pastor Roger today. He said that he was near our home…so he stopped by. It was nice to see him as always & I got my communion in! Last night I was able to go out to dinner with a friend, so overall it has been a very fun & busy week! After the movie tonight we headed over to Jason’s deli. It wasn’t the greatest choice for a Friday night, but it was our best possibility for a not too busy “wheelchair friendly” place to go. They made up for it (to my dad) with the free ice cream. Thank goodness for that! That is all for now. I will try to update more tomorrow! Thankful: I am thankful for a fantastic movie that makes my mom laugh! Love it! We saw MegaMind with Jocelyn today and hope to see Morning Glory some time this weekend. Thanks for the positive review. Had the best time visiting with Julie Wednesday! Hope my non-stop stories did not tire her out too much! I remember this cute family picture hanging in our dorm room freshman year at Iowa State! I love it!